Welcome to Serendipity Manor, your unique destination in paradise. Perfect for those traveling with an entourage, or just a lot of friends and family! 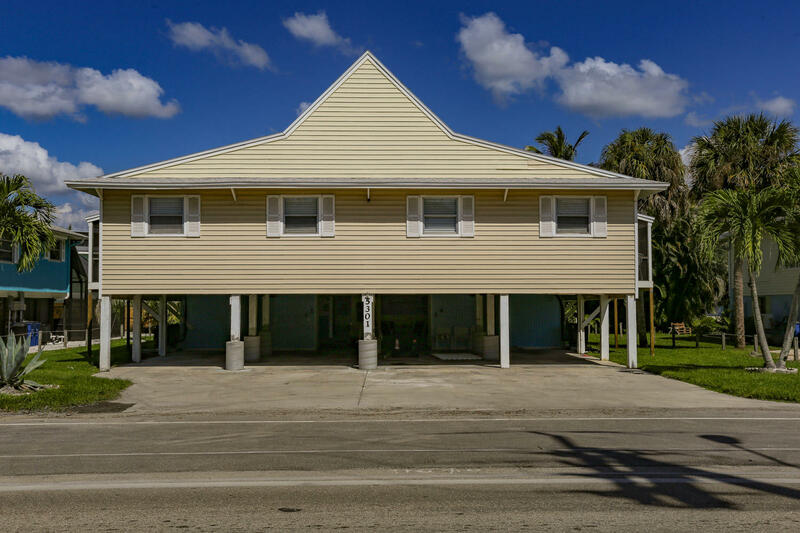 All accommodations are newly refurbished, nestled about midway down the island, with deeded beach access just steps across Estero Boulevard. Away from the hustle and bustle of Times Square, affording quiet relaxation for that desired getaway, yet just a short walk along the beach to the south is a kiosk for jet-ski rentals, parasailing rides, and even dolphin tours along a 7-mile stretch of white, sugary sand beach. 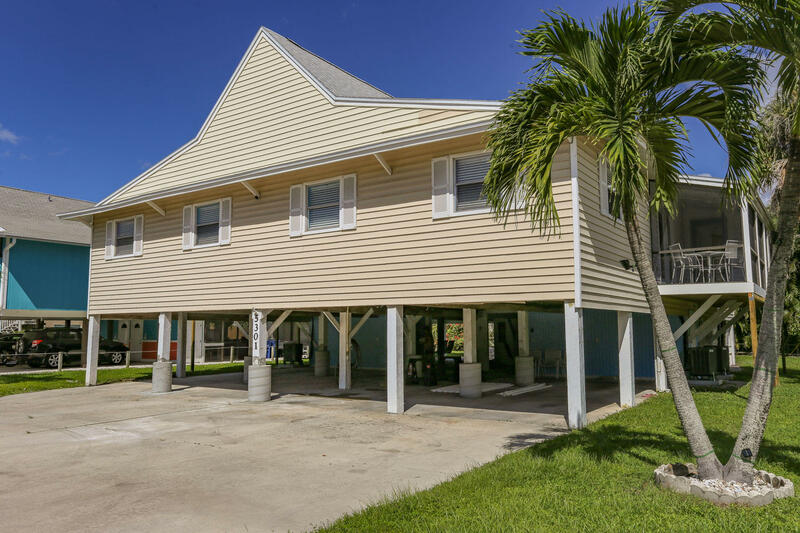 Also at your disposal on the property you'll find beach wagons, shell bags, sand toys, chairs, coolers, and umbrellas to set up your own domain out on the beach for daytime beach activities, and to view the endless variety of evening sunsets. Let your imagination be your guide. In addition one of the island's largest supermarkets and an upscale bistro on the bay is just a 2-minute car ride away. Trolley service along the boulevard is available to transport you to Times Square, with all of its restaurants, clubs, and night life. 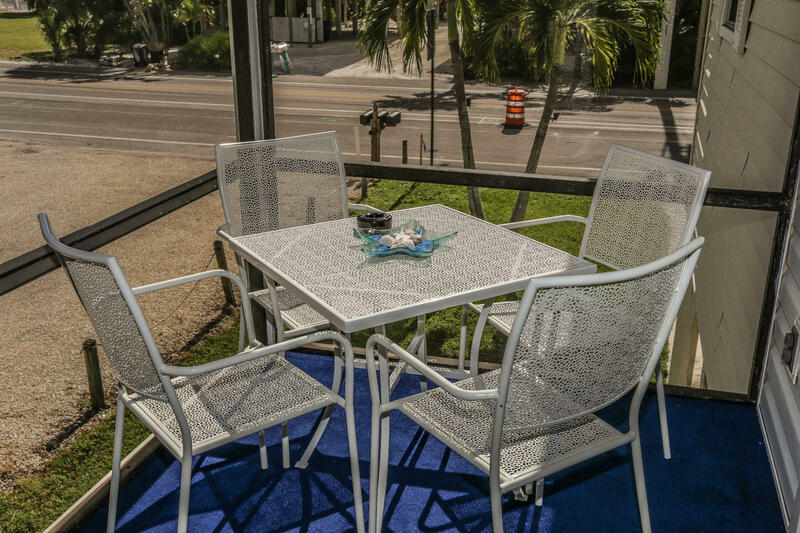 This venue is equipped with all the amenities you are accustomed to at home, PLUS the tropical setting! Upon arrival there are 3 bays of parking beneath the building, accommodating 2 vehicles in each bay. 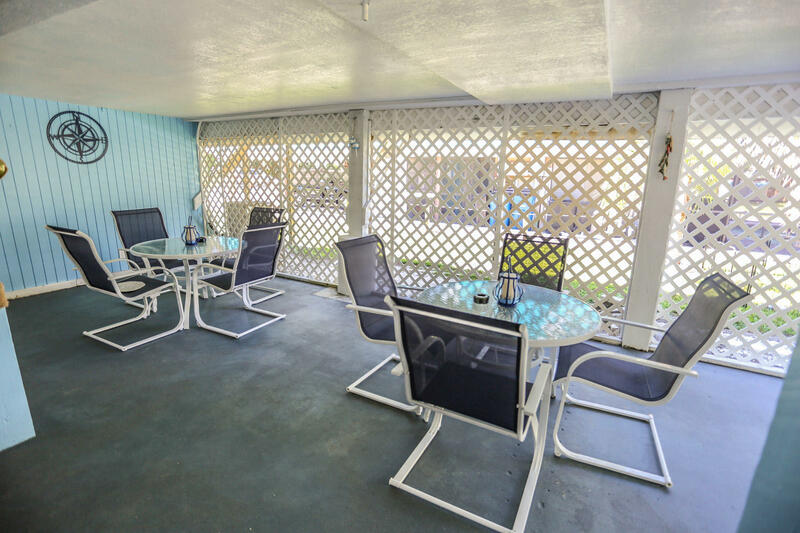 Also downstairs are beach equipment rooms, a large open area with several tables and comfortable chairs, a built-in sink with tiled countertop for rinsing your shells, and a great place to use the gas barbecue grill. 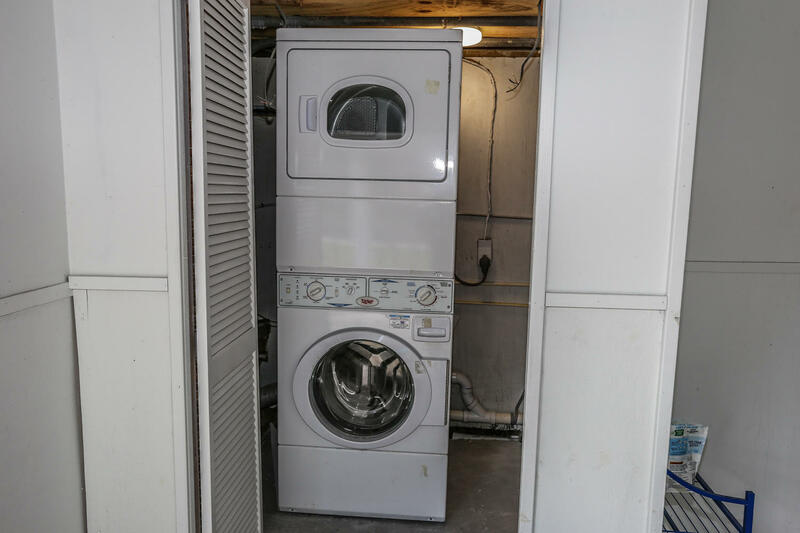 Washer and dryer are also in this area. All lower levels have evening ambient lighting. 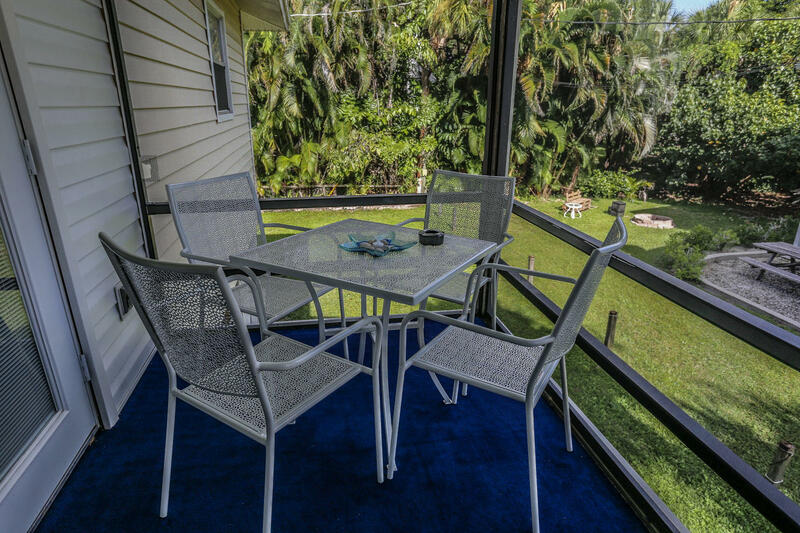 Lattice work surrounds this screened in area. 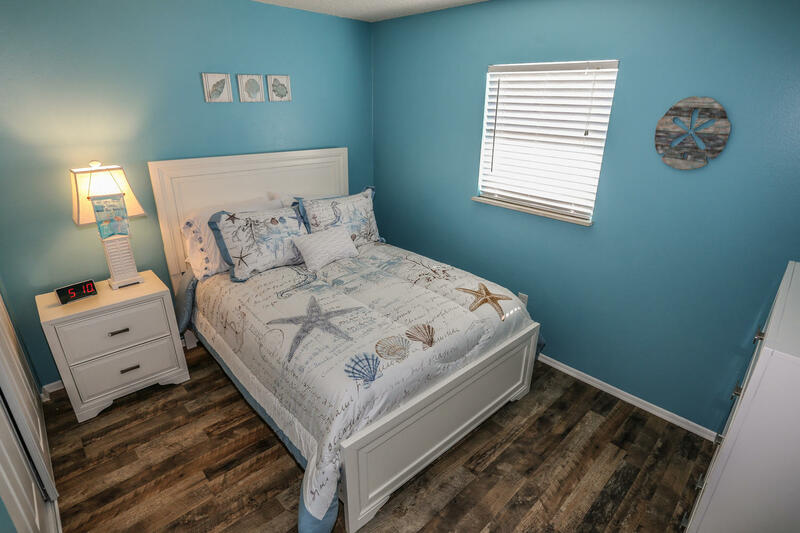 The Manor consists of three separate units, providing a total of 6 bedrooms, 3 bathrooms, as well as 3 fully stocked kitchens, living rooms, and dining areas. 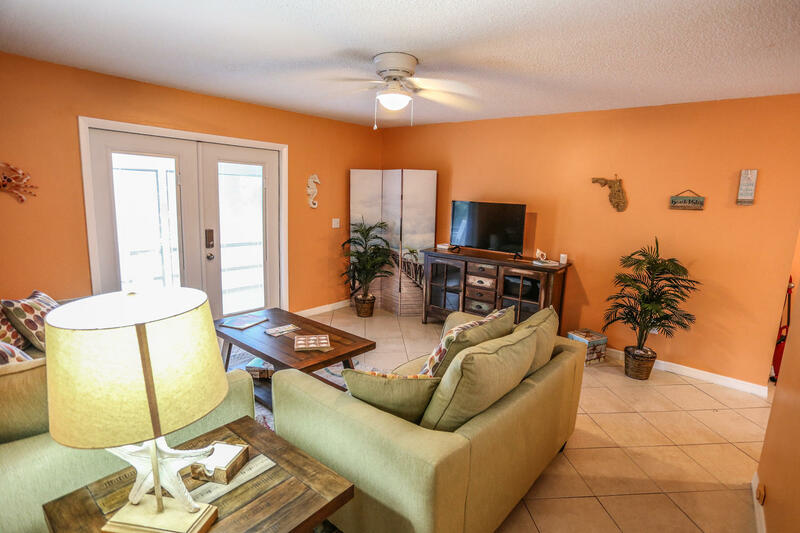 Going up the carpeted stairs to the left (equipped with twilight ambient lighting) brings you to the first apartment, entering into a tastefully furnished and carpeted screen enclosed patio/balcony. Ambient evening lighting also bathes the patio in soft light. 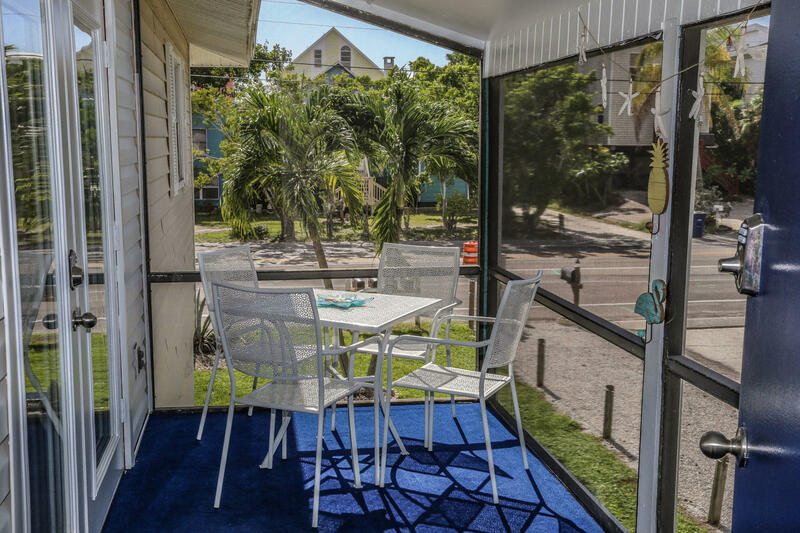 French doors open into the nicely beach-motif furnished living area with two sofas, one of which opens up into a full size bed. 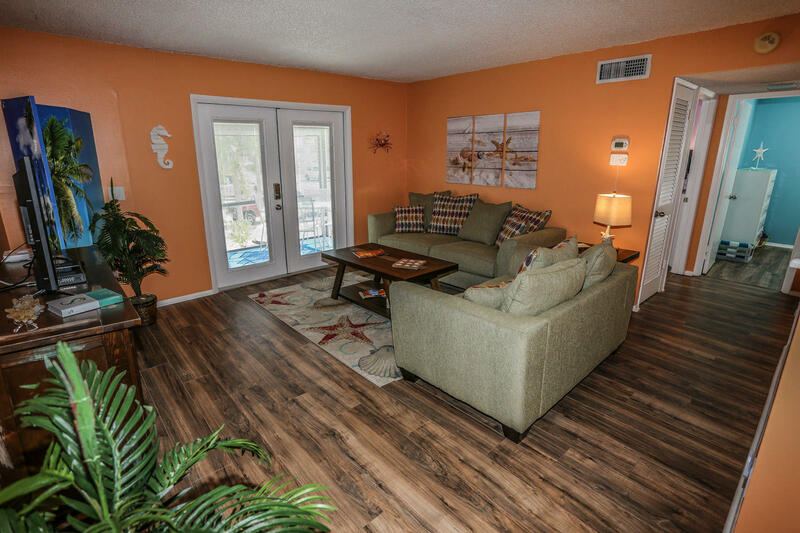 Tile flooring and decorator rugs warmify the living/dining areas. For your enjoyment is a flat screen TV with 100-channel cable, and 1 gigabyte Wifi. 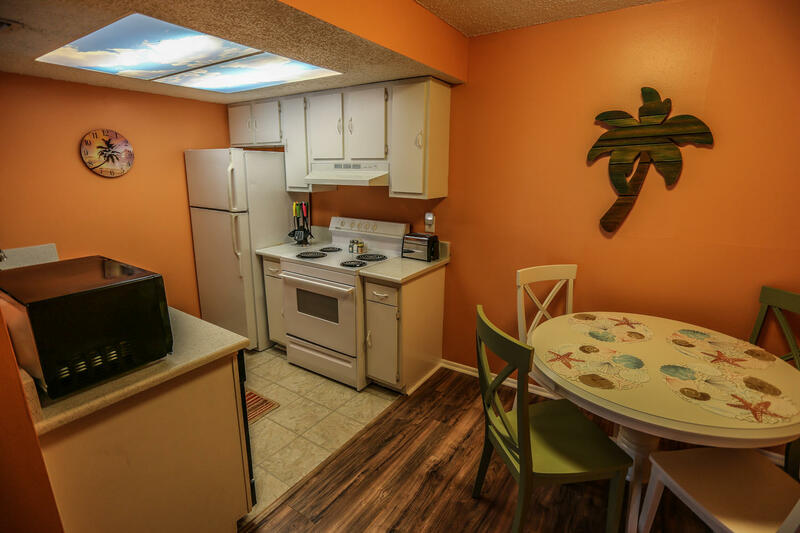 Walking on into the dining area finds a table seating 4, and a fully equipped kitchen with quartz countertops. Everything is available that you would need to cook daily multi course dinners, or simply make a pot of coffee in the morning. And for those barbecue enthusiasts, there is a gas grill on the lower level as noted above. 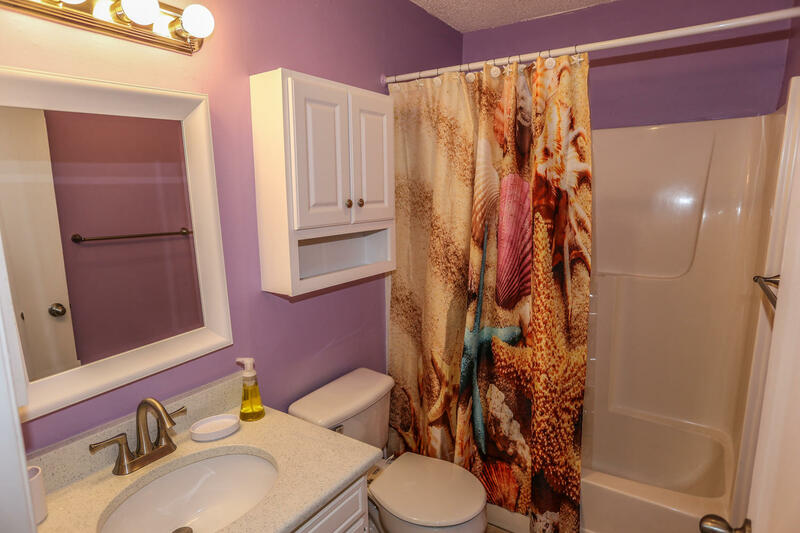 Leaving the kitchen/dining area, following the hallway to the left finds a well-appointed bathroom with lavatory vanity and tub/shower combination, with an amazingly vivid shower curtain showing a collection of starfish and shells. 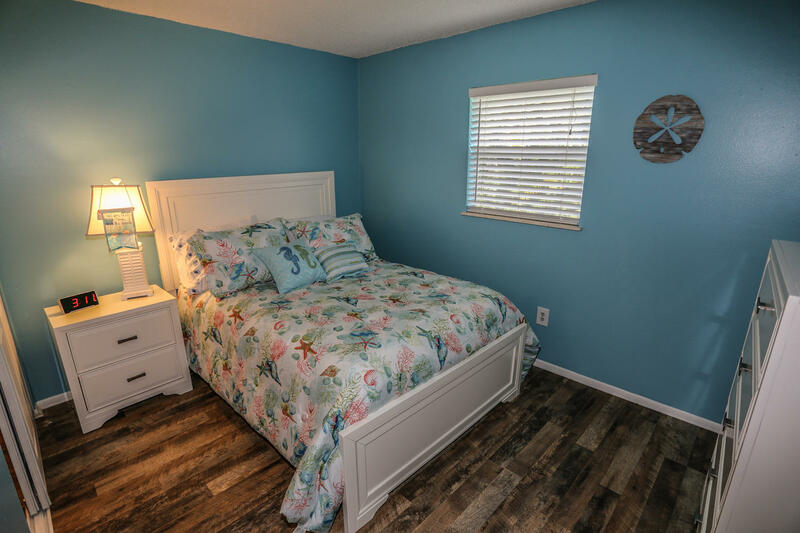 Finally there are two beautifully decorated bedrooms with wood flooring. 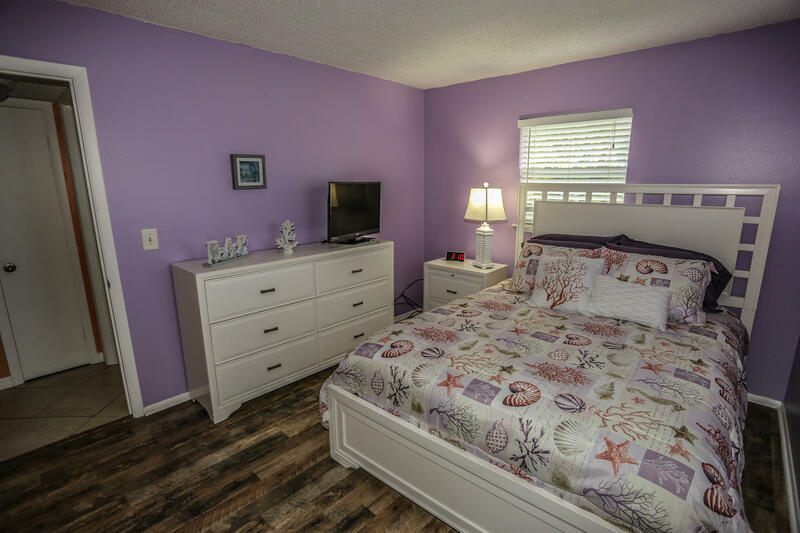 The bedroom on the right has a queen size bed, closet, plenty of dresser space, as well as flat screen TV. 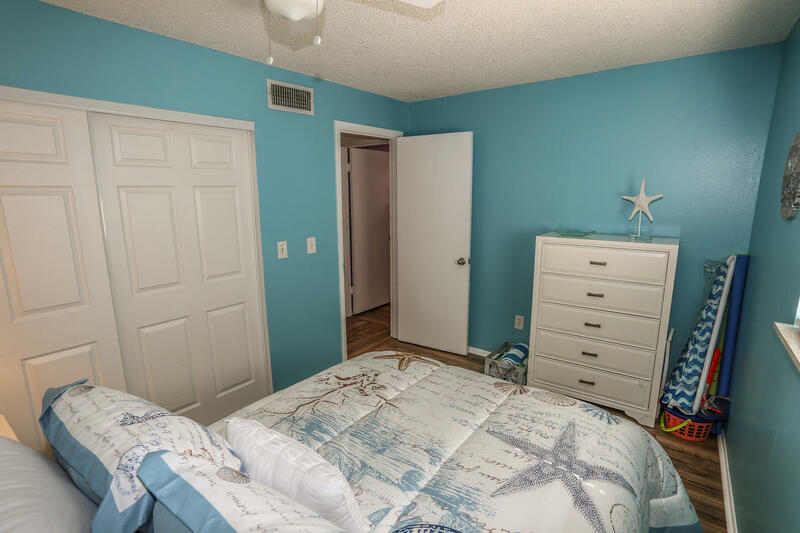 Similarly the bedroom on the left has wood flooring, but with a full size bed. 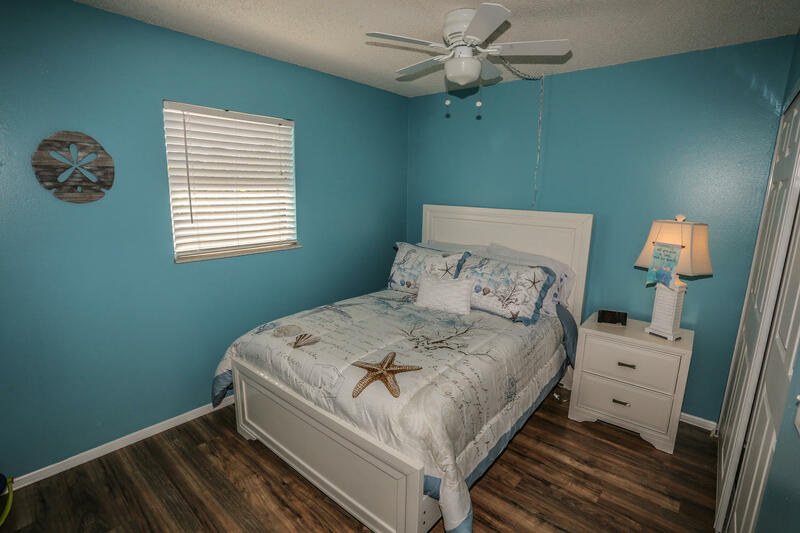 Other amenities include stocked linen closet, iron, ironing board, and fresh towel bins in the bedrooms. 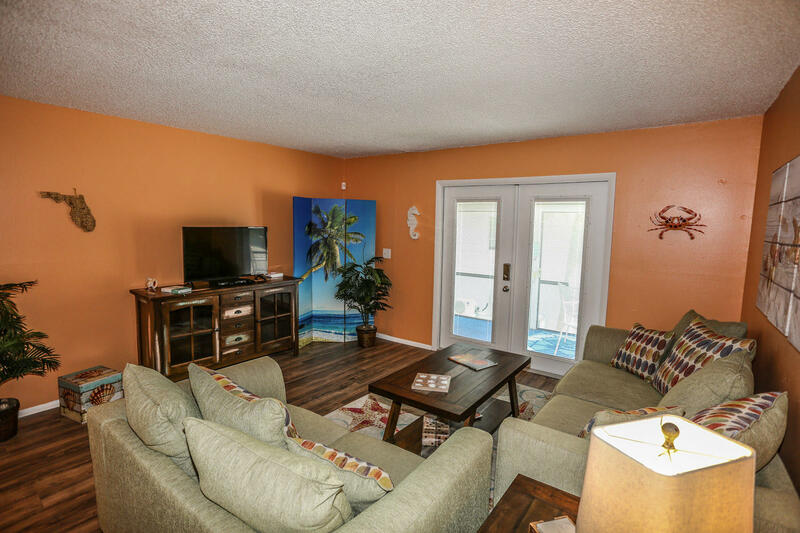 Going back out and up the carpeted stairs to the right (also equipped with twilight ambient lighting), turning right at the top of the stairs, brings you to the second apartment, with equally tastefully furnished and carpeted screen enclosed patio/balcony. Ambient evening lighting also bathes the patio in soft light. 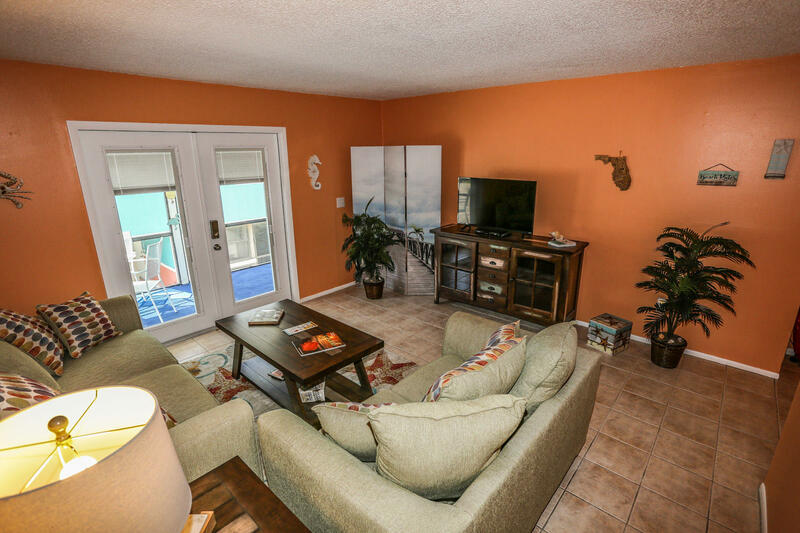 French doors open into the nicely beach-motif furnished living area with two sofas, one of which opens up into a full size bed. Wood flooring and decorator rugs warmify the living/dining areas. For your entertainment is a flat screen TV with 100-channel cable, as well as 1 gigabyte Wifi. 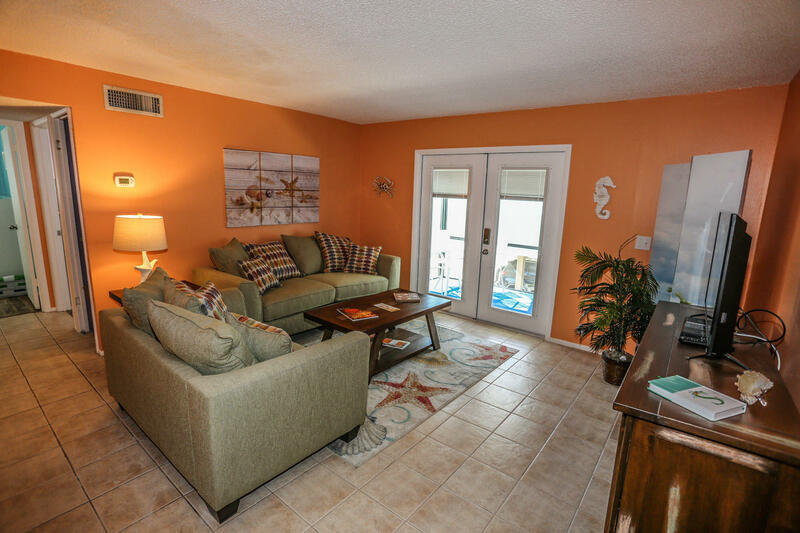 Walking on into the dining area finds a table seating 4, and another fully equipped kitchen with quartz countertops and tile flooring. In this kitchen there is recessed lighting with blue sky and clouds, adding to the airiness and colorful ambiance. 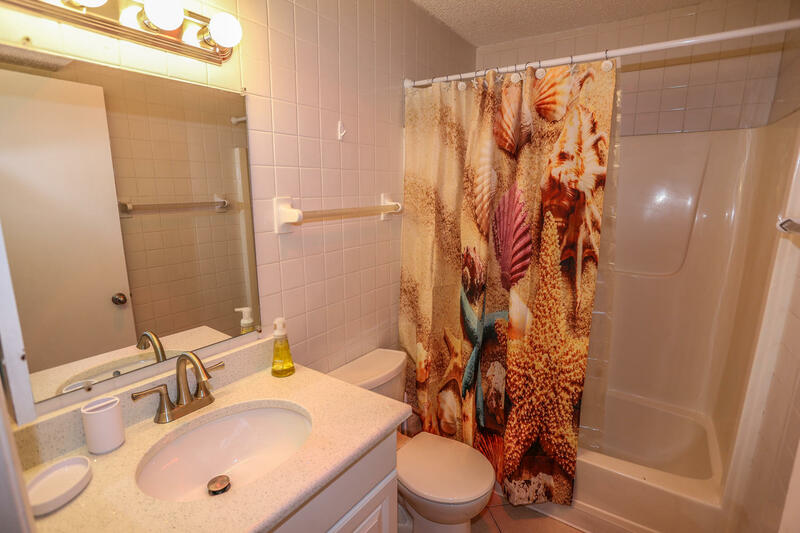 Leaving the kitchen/dining area, following the hallway to the right finds a well-appointed bathroom with lavatory vanity and tub/shower combination, with an amazingly vivid shower curtain showing a collection of starfish and shells. The bathroom also has tile flooring. 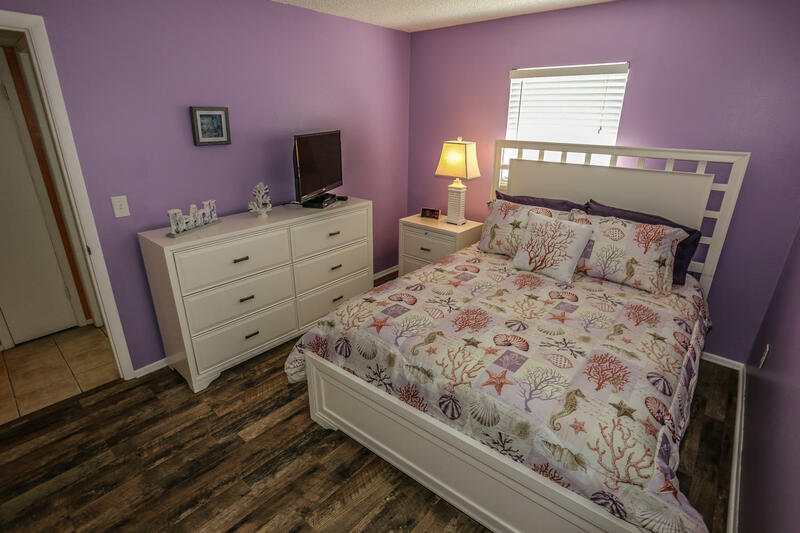 Lastly there are two beautifully decorated bedrooms with wood flooring. 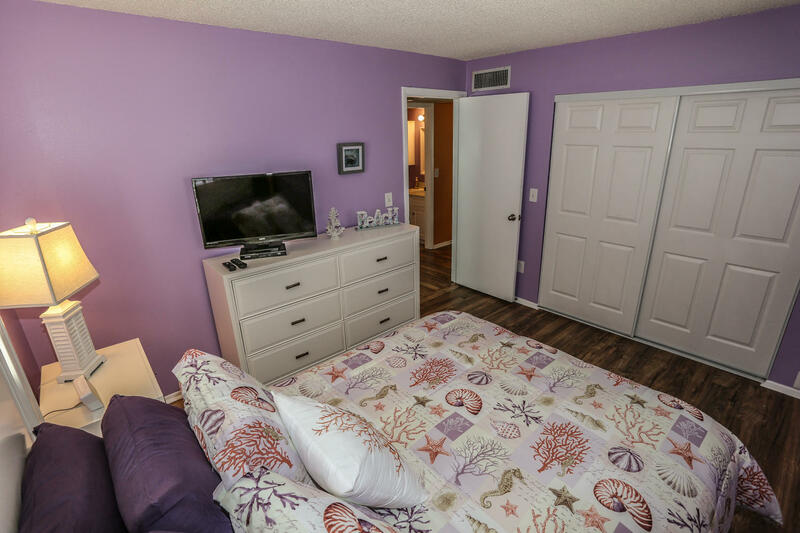 The bedroom on the left has a queen size bed, closet, plenty of dresser space, as well as flat screen TV. 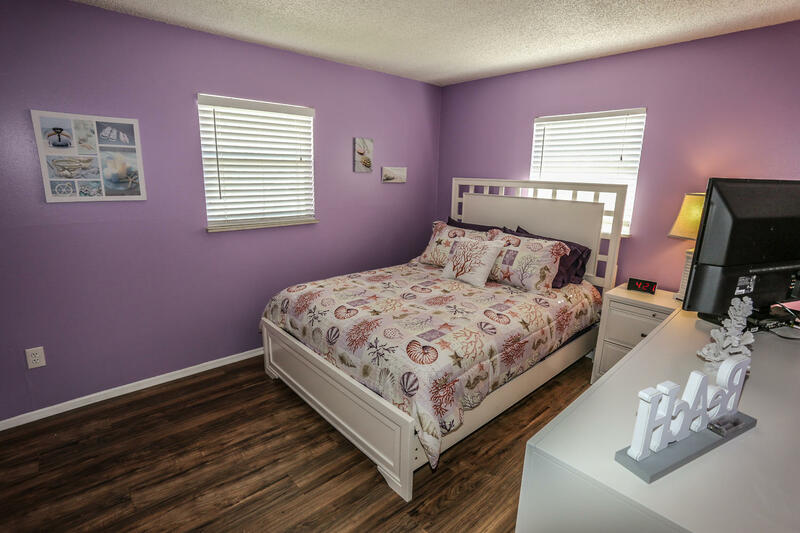 Similarly the bedroom on the right has wood flooring, but with a full size bed. 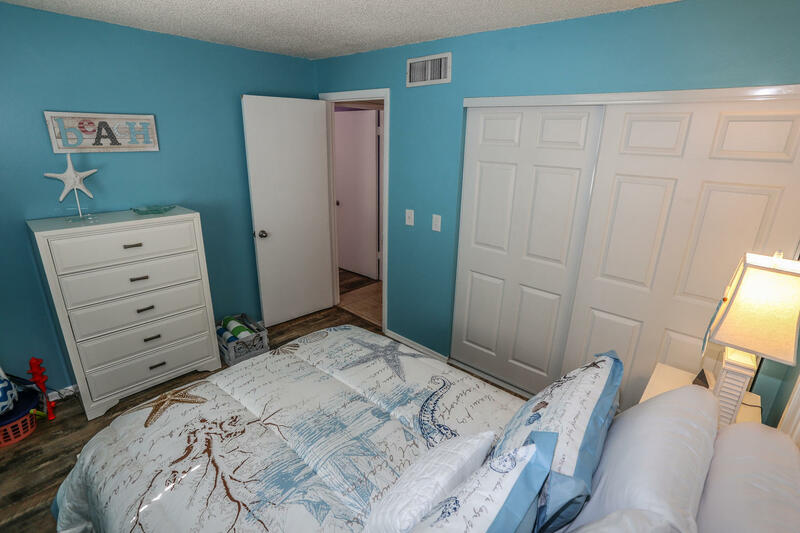 Other amenities include stocked linen closet, iron, ironing board, and fresh towel bins in the bedrooms. 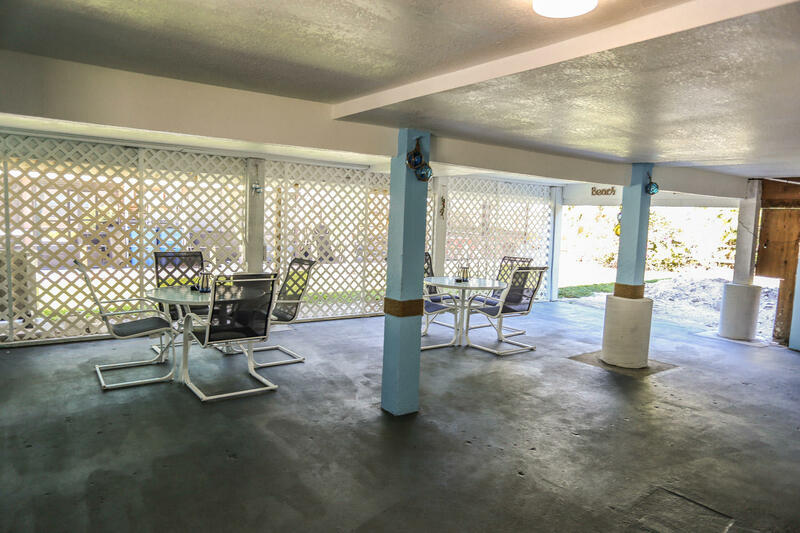 Upon exiting the second apartment, opposite and also upstairs is the third apartment, again entering through the similarly furnished and carpeted screen enclosed patio/balcony. French doors then open into the nicely furnished living area with two sofas, again one of which opens up into a full size bed. 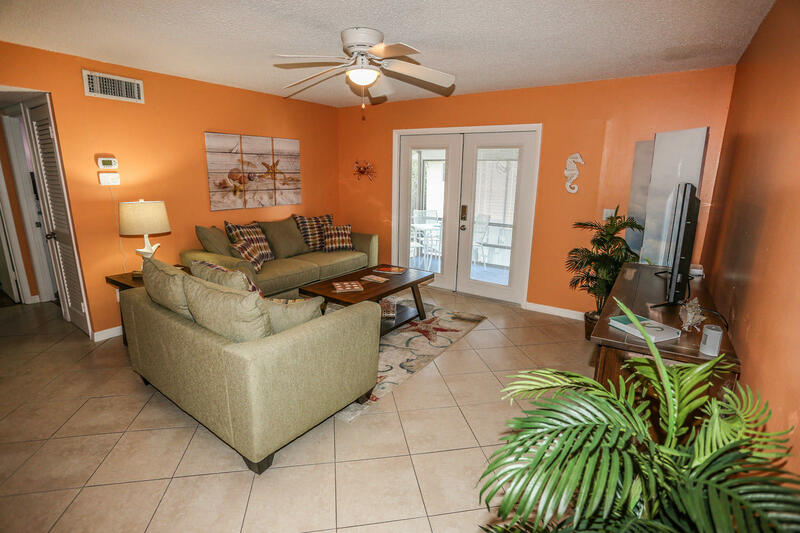 Tile flooring and decorator rugs warmify the living/dining areas here as well. Flat screen TV also in this living room, with 100-channel cable and 1 gigabyte Wifi. 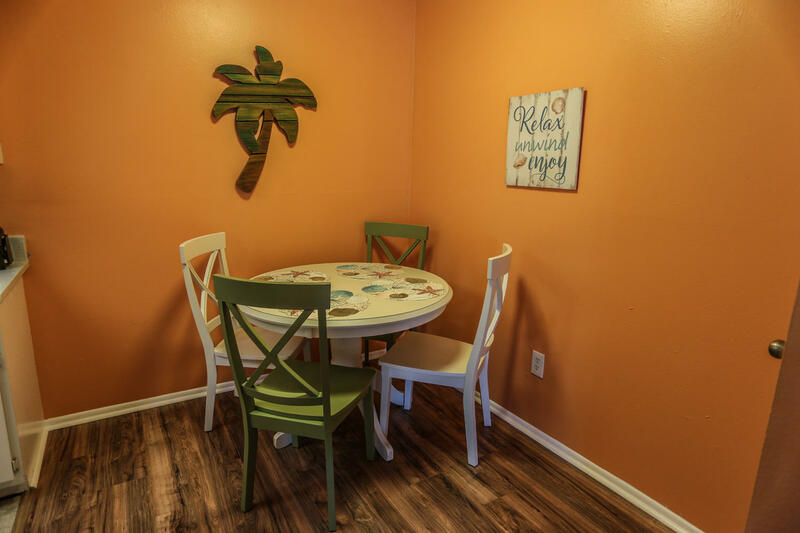 Continuing on into the dining area finds a table seating 4, and yet another fully equipped kitchen with granite countertops and tile flooring. In this kitchen there is also recessed lighting with blue sky and clouds, adding the same airiness and colorful ambience. 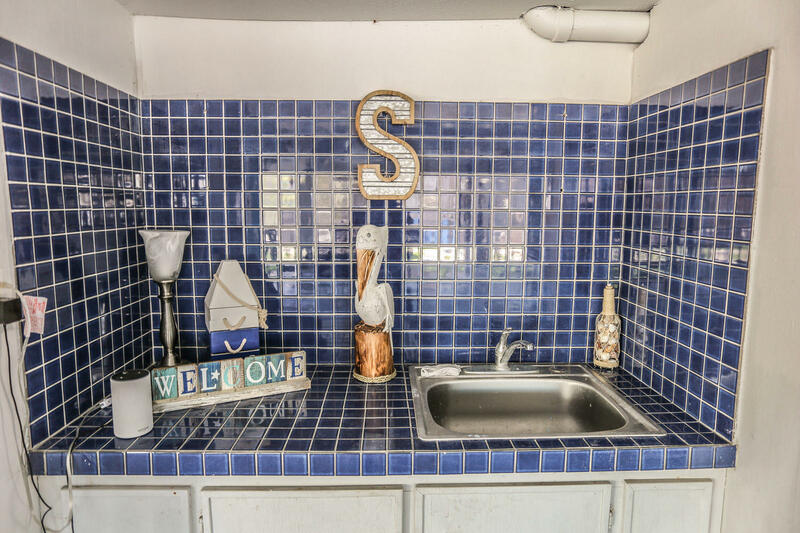 Leaving the kitchen/dining area, following the hallway to the left finds another well-appointed bathroom with lavatory vanity and tub/shower combination, again with picturesque shower curtain showing a collection of starfish and shells. 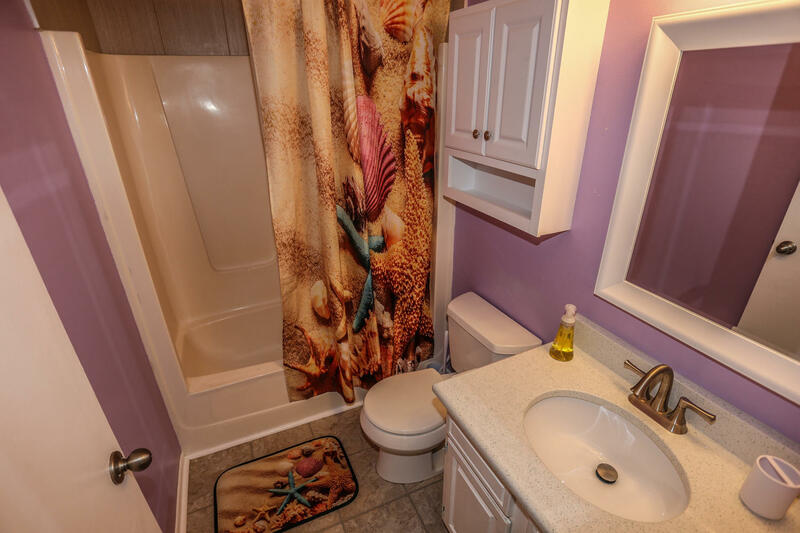 The bathroom also has tile flooring. 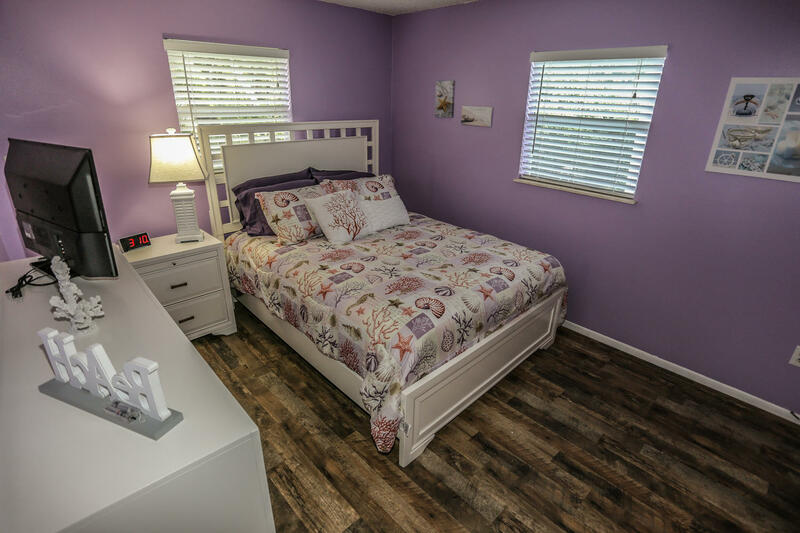 Then there are the two beautifully decorated bedrooms with wood flooring. The bedroom on the right in this apartment has a queen size bed, closet, plenty of dresser space, as well as flat screen TV. 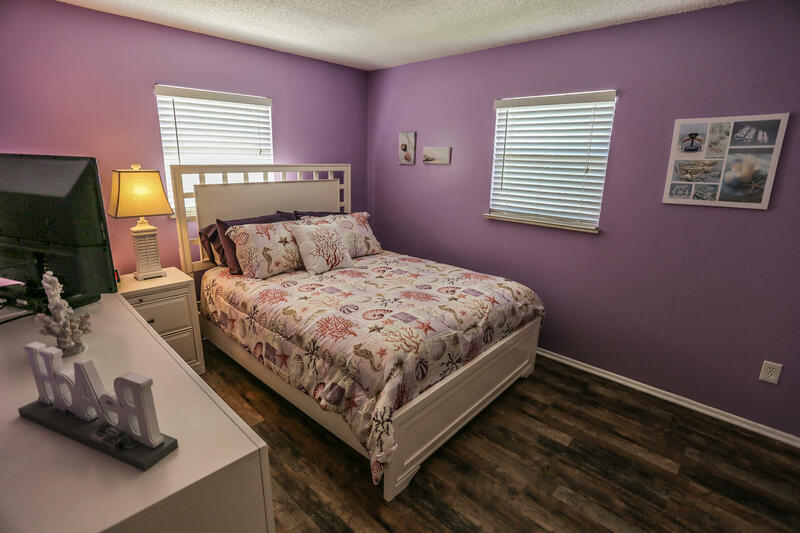 Similarly the bedroom on the left has wood flooring, but with a full size bed. Again, amenities include stocked linen closet, iron, ironing board, and fresh towel bins in the bedrooms. 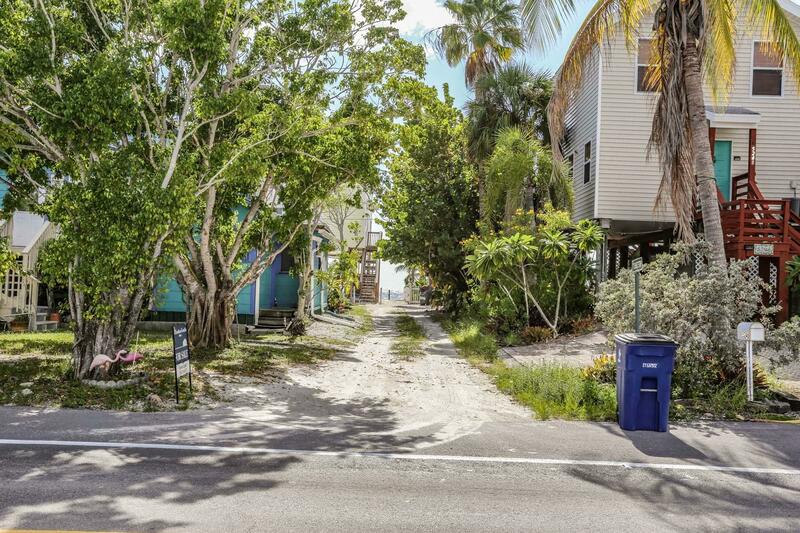 Estero Island has numerous restaurants and night life for your choosing, and you are in the middle of it all location-wise. Water activities abound. In addition to the jet ski rentals and parasailing noted above, there's also fishing charters and other close by things to do and places to visit. We also have a company that rents many items needed for the little ones, or sports and special needs equipment. 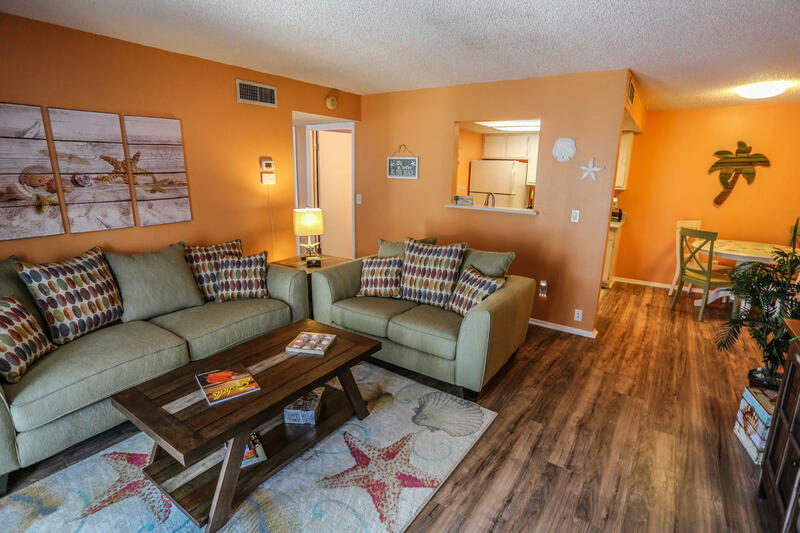 Our rental properties are all outfitted with high tech features such as remote entry locks, high speed wireless internet, etc. 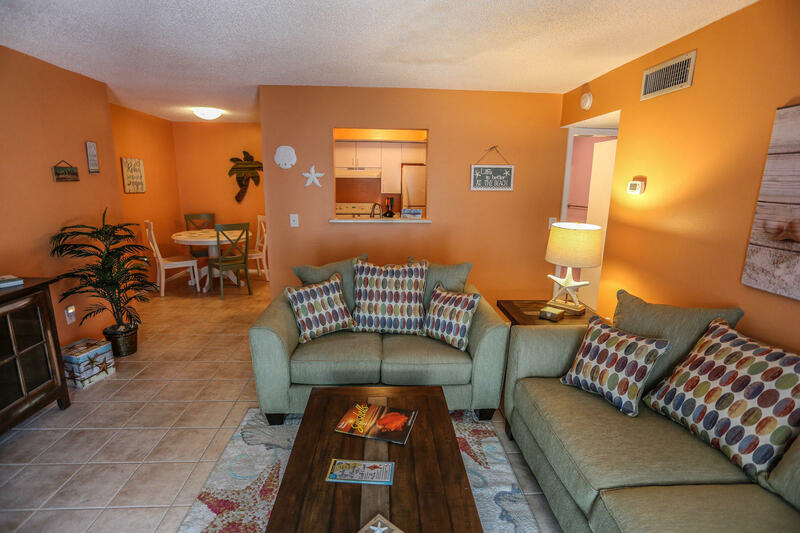 In addition, for our guests with allergies, this property is both nonsmoking and pet-free. 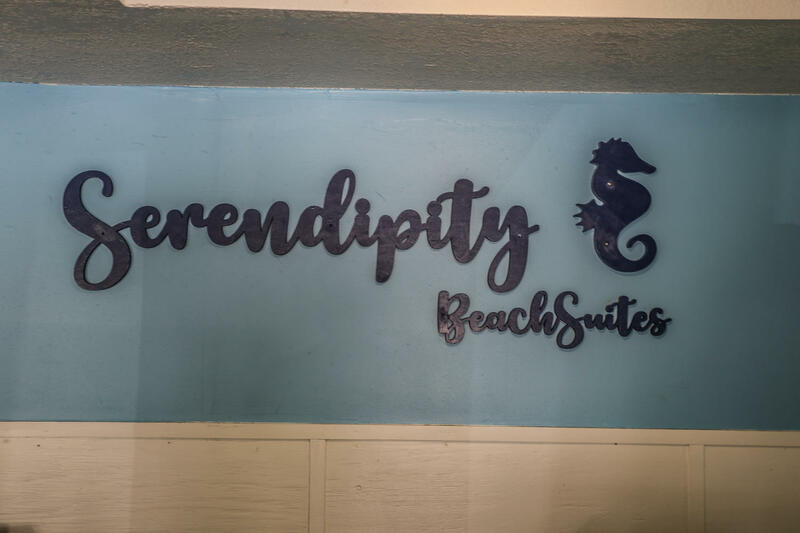 If Serendipity Manor at 5301 Estero Blvd. sounds like something you would like to experience, then give us a call or book online today!